The remarkable story of 12 boys from a Thai football team and their coach gripped the world in June 2018. This is my personal account of how the Thailand cave rescue operation unfolded - and ended. It all began on the 23rd of June in Chiang Rai Province, in northern Thailand. The young boys, aged between 11 and 17, went exploring inside Tham Luang cave. They had a simple plan to enjoy a birthday celebration for an hour or two inside the cave. But, tragedy struck the junior football team. Twelve young boys and their 25 year old assistant coach got trapped. They were deep inside a huge mountain cave with no way out. This unbelievable operation developed into an incredible story of human endurance and friendship. The whole rescue bid serves to highlight the lengths that some of the bravest people will go to. The mission was to save the lives of 12 young boys from the Wild Boars football team and their teacher. But, it was a race against time, a war with water, and all carried out inside a mountain of darkness. The locals refer to them as the caves of Mae Sai, located in the northernmost district of Chiang Rai. Mae Sai is a major border town close to Myanmar and where you find Tham Luang (Great cave). Tham Luang has the fifth longest section of navigable cave in the Kingdom of Thailand. Underground, alleys and pathways snake around for 10 km below a cloud-swathed mountain range. The unabridged name for the mountain range is Tham Luang Khun Nam Nang Non. It has a shape and outline that resembles a reclining woman. It would be something like 'the great cave and water source of the sleeping lady mountain'. That sounds quite serene and innocuous right? The locals are familiar with its dangers - it is not the first time that people went missing in Tham Luang cave. The most dangerous time of year is during the monsoon season. Heavy and persistent rains generally start in July in this region and then continue for a few months. As a rule, local residents would only enter the cave between November and April. When it floods during the rainy season, the cave can flood up to 5 metres (16 feet) in places. The boys cycled through the rice paddies and up into the forested hills after their football practice. Rain and thick clouds had blanketed the area in recent days. When they reached the mouth of Tham Luang they left their bikes and bags at the entrance to the cave. They had ventured deep into Tham Luang before, sometimes they advanced as far as eight (8) km. But, this time all they had with them was their torches. The families of the Wild Boars team started to worry when the missing boys did not return home as planned. The team had announced their planned visit to Tham Luang earlier on a messaging app to other friends. The parents made their way straight to the cave. They found the bikes outside along with their bags and some football shoes. The parents knew something was amiss and they raised the alarm! Most of the news reports suggest the boys got caught off-guard by a severe flash flood. True, there had been heavy rain falling on the mountains and that cave system fills up very fast. The water levels were rising and they had to get out. But, a turn of events meant they needed to scramble even deeper into the cave to escape the flooding waters. The group sought refuge on a small rocky dry shelf - known as 'Pattaya Beach'. It was a 4 kilometre distance of nooks and crannies from the safety of the cave exit. It is an unforgiving mountain range that towers above Mae Sai. It had swallowed up the group of twelve boys and their coach and surrounded them with darkness. Fear would haunt anyone in that situation and they lost all sense of time. They used rocks to dig out a small cavern where they huddled together and shared body heat to keep warm. The assistant coach, nicknamed Ake, was a former monk. He taught basic meditation techniques to the young boys in the darkness. It helped them to stay calm and conserve the falling air supply inside the pathway. He got them to lie still which also helped to conserve their strength. Most official accounts of the story say they had very little food - if any at all. But, they did have a supply of cold drinkable water. It came in the form of moisture dripping down from the cave walls. Darkness surrounded them but they did have some small torches to share between the group. The porous limestone and cracks in the rocks meant they had a good air supply - for a while. But, they had no idea how long the oxygen levels might need to last them. It is reasonable to accept that all these conditions influenced the outcome. The Wild Boars were all counting on one another to survive the ordeal. But, in reality, what they needed was the most difficult part of all - the rescue! 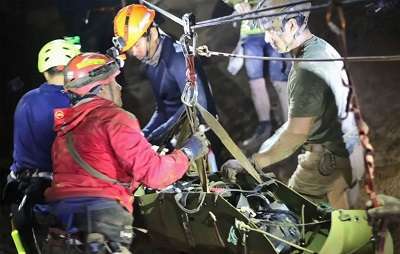 A full-scale rescue operation unfolded outside the cave. Thai authorities called in several teams of experts. They included the elite Thai Navy Seals and the national police. There was also a gathering of other specialist rescue teams and local volunteers. 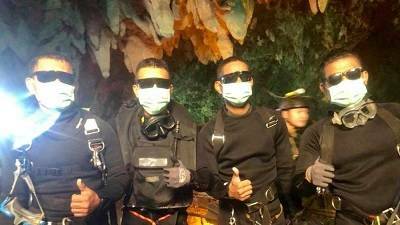 Even so, the Thai Navy divers had negligible cave diving experience. They found the craggy submersed terrain challenging to navigate. Merciless weather added to the complexities. The heavy rainfall had flooded many of the chambers. It cut off rescuers from parts that were usually accessible inside the cave. Mechanical engineers started using heavy equipment to pump water out of the cave. Others tried drilling into the mountainside. They were searching for cracks that might provide some access into the cave system. The primary objective was to locate exactly where the boys were. Rescuers approached locals in the village for any inside knowledge that might help. The Thai Navy Seals got it from one of the Wild Boars who skipped the cave expedition. The boy said the group often visited a 'dry' area called 'Pattaya Beach' named after Pattaya holiday resort. Could it be where the 13 were taking refuge? At this point, the story of the Thai cave rescue operation had gained the attention of the nation - and beyond. Social media around the world lit up with expressions of prayer, love, and support. And yet... this absolutely amazing story of bravery and heroism was going to get even bigger. A team of international rescuers arrived at Tham Luang on Thursday the 28th of June. The so-called 'All Stars' included US air force rescue specialists and other renowned cave diving experts. They came from Australia, Belgium, Scandinavia, and the United Kingdom. Note: Many of the internationals were volunteers. But, others got called in to help by the Thai authorities. In fact, there were more than 1,000 rescue workers involved. The next few days proved to be a constant battle with the terrain and the elements. The divers had to swim against very strong water currents. At times, the rising floodwaters were so strong it forced them back along the chambers. The mission grew in difficulty and in danger. The rescuers had made some progress by Sunday the 1st of July. By this time, the boys had already been missing for over a week. The experts set up a key base camp at one of the large caverns. Later named 'chamber three', it would also serve as a supply point for the cave divers. Two British divers made the breakthrough on the following day. It was John Volanthen and Rick Stanton who made the incredible discovery on Monday July the 2nd. The two divers surfaced in an air pocket some distance past 'Pattaya Beach'. Once more, they shouted and smelled for signs of life in the air pocket. This is standard procedure for these types of rescue operations. In fact, John Volanthen said they could actually smell the children before they could see them or hear them. John moved his torch and illuminated an inconceivable sight. Startled and bemused, the boys emerged from the darkness. They scrambled down from the elevated muddy ledge to greet him. As Rick began counting how many boys he could see, John asked them in English: "How many of you?" "Thirteen!" came the reply from one of the boys (in English). John and Rick could not believe what they were seeing. They had found the lost Wild Boars alive inside Tham Luang cave. Despite the obvious relief at seeing the divers emerge from the murky water, the boys had been alone for 9 days. John and Rick spent some time on the ledge talking to the juniors - attempting to boost their morale. Before they left, the two guys gave extra torches to the boys. They also gave them a stern promise to return as soon as possible with food and medical supplies. Yes, the divers recorded the extraordinary encounter on their helmet cameras. The story, and the jubilation, went viral as soon as they posted the images online. In fact, if I'm honest I will also admit that I have never refreshed my twitter feed so often when the good news broke. Of course, the parents were also euphoric at seeing the Wild Boars alive - though a little thin. Apart from that, they did look remarkably alert and in good shape. The next group of divers to join the boys and their coach was a military medic and a team of Navy Seals. The plan was for them to stay with the boys inside the chamber for the rest of the ordeal. The Australian doctor put them on a special diet while they remained trapped inside the cave. They could only have medicated liquid food and mineral water (with vitamins). The next step was figuring out how to extract them all from a flooded cave. It was a race against time and water. Many of the boys could not swim and none of them knew how to use scuba equipment. In fact, the minimum age to try scuba diving is eight years old - in very shallow water. But, you need to be at least 18 and have previous scuba experience to learn cave diving. Saman Gunan was a 38 year old former Navy Seal diver and one of many volunteers who did not hesitate to help in the rescue. The mission lost one of its heroes on the 6th of July. Saman was on a routine run delivering air tanks to the chamber where the boys were. The diver lost consciousness after running out of air. Despite his dive buddy pulling him out of the water, he failed to revive Saman Gunan. There was no reason to delay the funeral and it took place later the same day. As is the Thai way, Buddhist monks burned incense and murmured prayers for Saman. The death highlighted how dangerous the rescue mission was going to be. It also reiterated some of the risks that the boys faced. 12-16% oxygen levels increase breathing and heart rate. 10-14% oxygen affects judgement and coordination. 6-10% causes nausea and vomiting (and often a loss of consciousness). <6% brings on convulsions, the breathing stops, and cardiac arrest is likely. Finding an alternative passage into the cave or drilling one. Continue pumping the water out from the cave and waiting for the levels to recede 'naturally'. The general consensus was that this could in fact take up to four months. 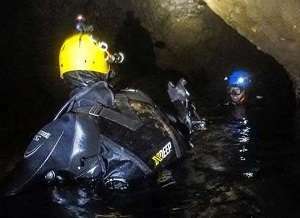 Train the young boys to scuba dive through the flooded areas of the cave. Many of the experts saw this option as the last resort because of its inherent dangers. Note: Engineers working for Elon Musk built a kid-sized submarine. But, divers dismissed the fourth option as 'unsuitable' for this particular rescue bid. "We're Pulling out the Boys - Now!" In preparation, the divers began practicing with a few local lads at a nearby swimming pool. They were trying to figure out the best way to transport a child underwater - and in the safest manner. Thai authorities made an unexpected announcement on Sunday the 8th of July. They said they were going to pull the boys out - starting right now. Narongsak Osotthanakorn was the head of the rescue operations. he said: "There is no other day that we are more ready than today". What was the reason behind the snap decision? In fact, the rationale was quite simple. The Tham Luang cave system would be completely flooded around the middle of July. Heavy rains had been pelting Mae Sai for several days. But, a break in the rain gave rescuers a short break from flooding and a new window of opportunity. The authorities asked journalists and non-essential volunteers to leave the immediate area. The general mood changed after the announcement at the cave rescue site. It became brisk and steely. But, the time had come. The team were ready to launch what many have since described as a 'superhuman' rescue effort. The treacherous journey involved close to 100 Thai and foreign divers. The plan was to split the extraction of the boys into two sections. The first section - from the rocky ledge where the boys were to chamber three - was going to be the most difficult. It took the rescuers several hours to make their way from the cave entrance to the boys' chamber. They had to walk, climb, and dive through muddy dark waters. In fact, much of the trek was a crawl on the rocky floor using the guide ropes to feel their way along. Some of the sections were very narrow. In fact, so narrow that the divers had to remove their scuba tank and squeeze their body through. I find it difficult to describe how scary that is - even for experienced divers. So, here is a link to a YouTube video clip [time 10:43] for anyone who wants to see how dangerous and scary that is. The rescuers assigned two divers for each boy - tethered to one of them. Despite a lack of scuba experience, the boys would be breathing through a full-face air mask. Each child had a cylinder strapped at the front of them and they would be in a face down position. The reason behind this was so the water would run away from their face. They planned to transport the boys in a 'shopping bag'. It was the best way to manoeuvre them during the perilous journey around the obstacles. There would be an increased level of danger at the narrow sections. At these points, the rescuers would need to unclip the boy's air tank to squeeze the stretcher through. The biggest fear was that the boys might panic at the narrow points. Claustrophobia and aquaphobia can cause a serious amount of anxiety. There are conflicting reports about the amount of sedation used to keep the boys calm. Even so, it looks very likely that they were 'heavily' sedated. Experts say the best way to avoid a panic situation was to keep them semi-conscious during the trek. Having completed half of the journey they would reach chamber three. Then came the time for the second phase of the rescue operation. Despite being somewhat less dangerous terrain it would still take a few hours to complete. It would take a team of five men to carry the child in a secured stretcher. There was one point where they needed to place the stretcher on a raft to pull it across a pool of water (chin-high deep). Rescuers also used a pulley system to winch the boys up several steep slopes. They formed a human chain to navigate some of the rocky areas. They would pass the boys along hand to hand or slide the stretcher on top of the large pipes used to pump out the water. Rescuers had to bring the Wild Boars out of the darkness one by one. Even so, they rescued them from Tham Luang cave in three separate groups. The operation would actually take three days to complete. The reasons behind this would be the need to replenish the diving tanks and to give the rescuers a break from fatigue. Medics would give the boys oxygen to breathe as soon as they exited the cave. Within minutes, the next step was to whisk them away in ambulances, or helicopter, to a nearby hospital in Chiang Rai city. The final group of the Wild Boars football team emerged from the cave on Tuesday the 10th of July. This was the day locals predicted that further rains would flood the cave. They got it spot on! Yet, the famed Australian doctor (Richard Harris) and Thai Navy SEALS still needed to come out safe. But, the water levels started to rise again. Witnesses say the level rose 30cm in one hour. It was a day that Buddha took full control of the situation in Thailand. All the rescuers emerged safe soon after the last boy went to hospital. Thai Navy Seal Chant: Hooyah! Some members of the Thai Navy Seals posted their reaction on Facebook. They said: "We are not sure if this is a miracle, science, or what." The 'Hooyah' is their signature to mark the successful end of an operation. The boys and the coach went through a series of health checks at the hospital. After weeks in darkness, they need to wear eye shades to protect their eyes. The government said they must quarantine the group to protect everyone against infection. Several types of dangerous microbes lurk inside caves. Among the biggest threats are infections from bats and rat urine. Authorities at the hospital said that some of the boys had minor lung and eye infections. They would need a course of antibiotics as treatment. Apart from that, the group appeared to be alert, in good spirits, and in good health - considering their ordeal. Local officials are making plans to convert the cave complex into a museum and a tourist attraction. Some of the revenue from that will help to reimburse those who lost out (e.g. the rice farmers). Water pumped out of the cave completely flooded many of the nearby rice paddies. In true Hollywood style, two production companies are researching the possibility of making a movie about the Thailand cave rescue operation. The Wild Boars and assistant coach Ake plan to shave their heads and spend some time inside a monastery. It is a Thai Buddhist tradition that will bless their lives. The families believe that doing so will cleanse them from the aftermath of an unfortunate experience.